A belligerent, tough-talking mayor could emerge as the next president of the Philippines after voters across the archipelago cast their ballots in Monday's election. Rodrigo Duterte, the long-serving mayor of the southern city of Davao, is leading in public opinion polls by as much as 10 percentage points over his nearest rivals, Senator Grace Poe and Interior Secretary Manuel Roxas, the preferred candidate of outgoing President Benigno Aquino. The 71-year-old Duterte has gained support with his profanity-filled speeches pledging to combat crime and corruption - including promises to execute criminals - along with notoriety due to crude boasts of his sexual escapades, drawing comparisons to U.S. Republican presidential candidate Donald Trump. 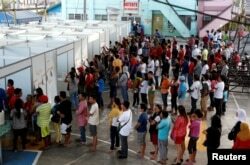 Residents queue in polling precincts to vote in national elections in Davao city, southern Philippines, May 9, 2016. Filipinos will choose a successor for President Benigno Aquino and candidates for 18,000 other elected offices. But Duterte's pledge to carry out his agenda even if he had to shut down the legislature has also stirred memories of Ferdinand Marcos, the country's late dictatorial president. About 55 million people across the archipelago's 7,000 islands are also voting for candidates in more than 18,000 federal and local offices. Aquino, who is leaving office after a constitutionally limited single six-year term, is credited with turning the Philippines into one of Asia's most thriving economies. But his critics say most of the country's wealth is concentrated among a small number of industrialists, and that the gap between rich and poor is extraordinarily wide.